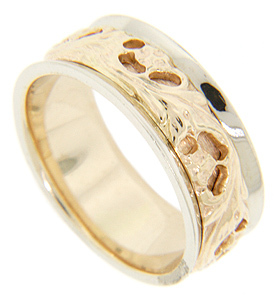 A flowing floral design crafted of yellow gold decorates the center of this 14K gold antique style men’s wedding band. The edges of the ring are made of white gold, are smoothly polished and are angled slightly inwards towards the ring’s center. The wedding ring measures 7.3mm in width. Size: 7. Cannot be re-sized, but we can reorder the ring in any size and in white gold, yellow gold, platinum and palladium. Price will vary depending on metal and size.